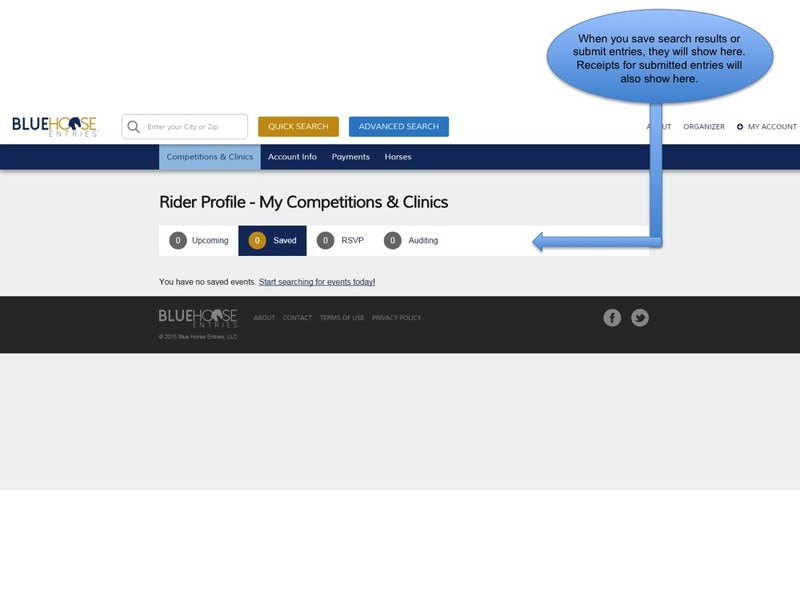 Whether using the QUICK SEARCH feature, you can now quickly and easily search for competitions and clinics listed by participating organizers. 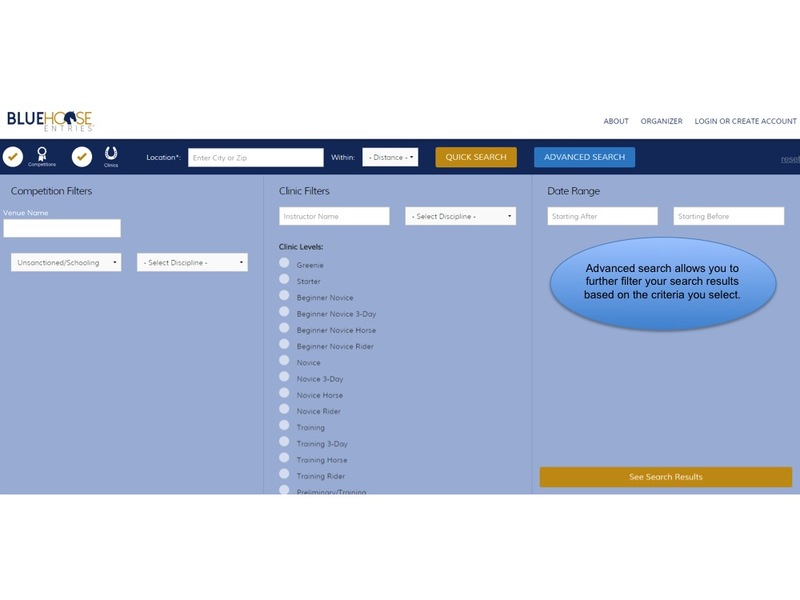 Now it is possible to screen for matching results based on search criteria selected by you. 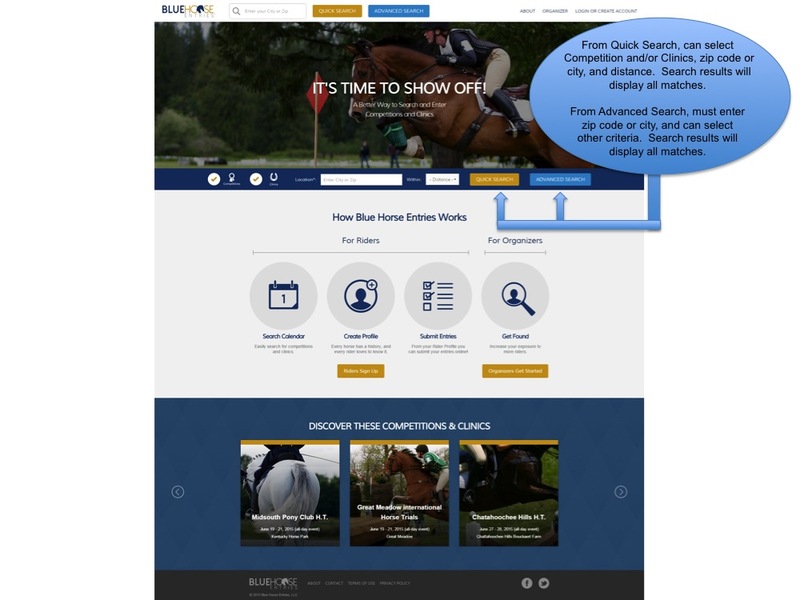 For competitions, you can search by location, dates, level, and more; and for clinics, you can search by several of the same parameters, plus instructor’s name. You no longer have to spend hours going back and forth, jumping from website to website, trying to find that best fit for your personal training schedule. New and different! 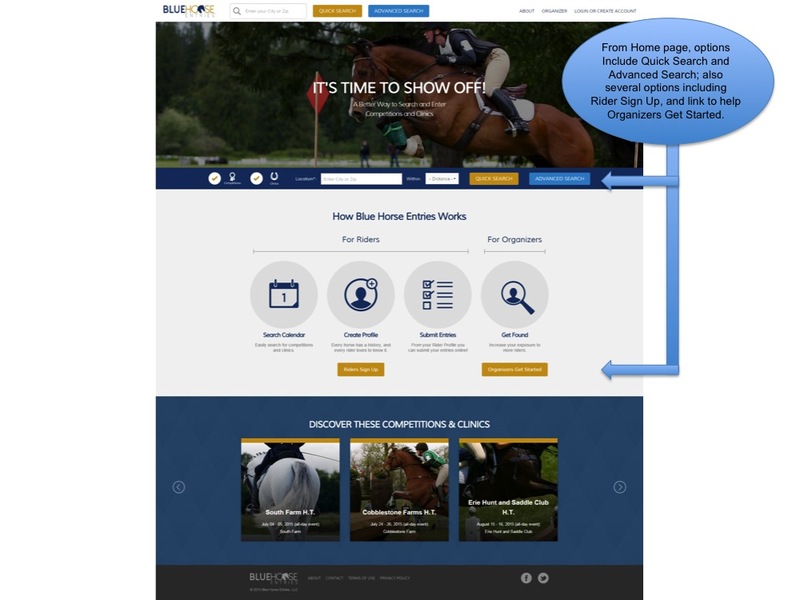 Now, amateurs to professionals, junior riders to seniors, whether you are still hoping for your first horse or already have a full stable, all will be able to create a Rider Profile. Each rider profile will contain at least the minimum information required for you to enter a competition or to participate in a clinic. With a rider profile, you will be able to expedite future entries; you can save selected search results of interest to your profile or add them to your calendar; and more. Don’t delay any longer; start planning now for a great year and create your Rider Profile today! Once you finish the QUICK SEARCH and you know where you want to ride next, from your Rider Profile you can submit your entries, sign, and pay — all online! Groups and individuals that have signed an Organizer’s Agreement will be able to add competitions and clinics to our calendar to help you with your search results. 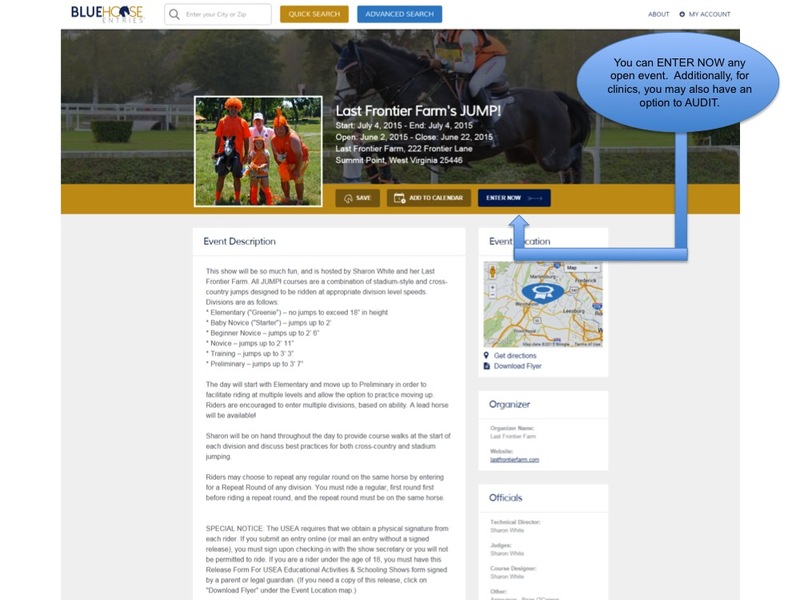 For unsanctioned/schooling shows or other riding opportunities where you typically register the “day of”, you can now indicate in advance that you plan to attend and still pay electronically after your last ride. If your favorite places to ride are not on our calendar, encourage the organizer to learn how to have their events listed on our calendar. 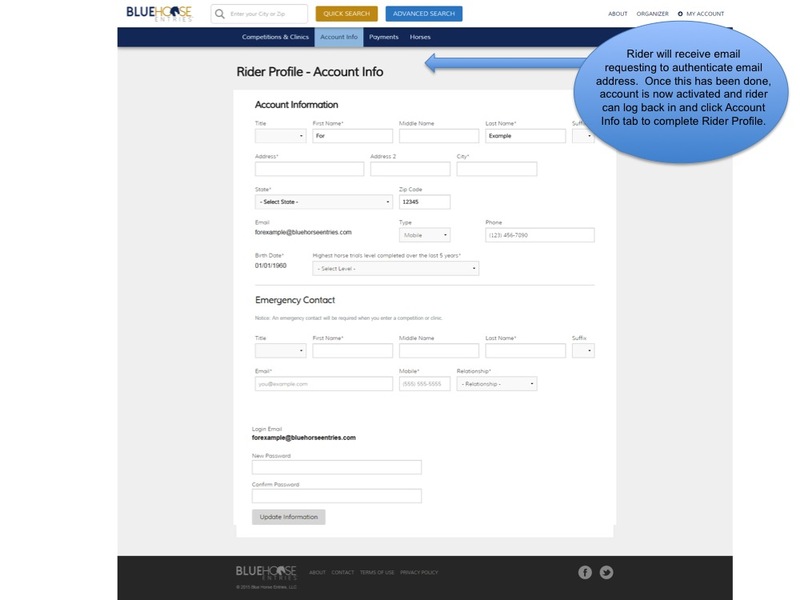 If you are an organizer of a competition, or a professional promoting an instructional clinic, you can now increase your exposure to more riders at the exact time they are searching for their next ride. Organizers and professionals desiring to have their riding opportunities show in the list of calendar search results can easily enter all relevant details, as well as provide a link to their own website for additional information. 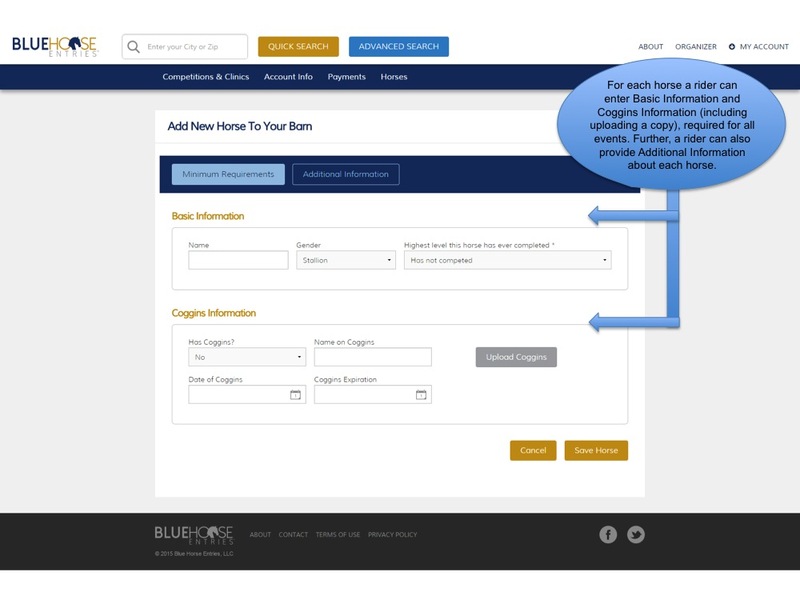 Interested organizers should contact us today to learn more about the simple steps to take to start listing your competitions or clinics with Blue Horse Entries. 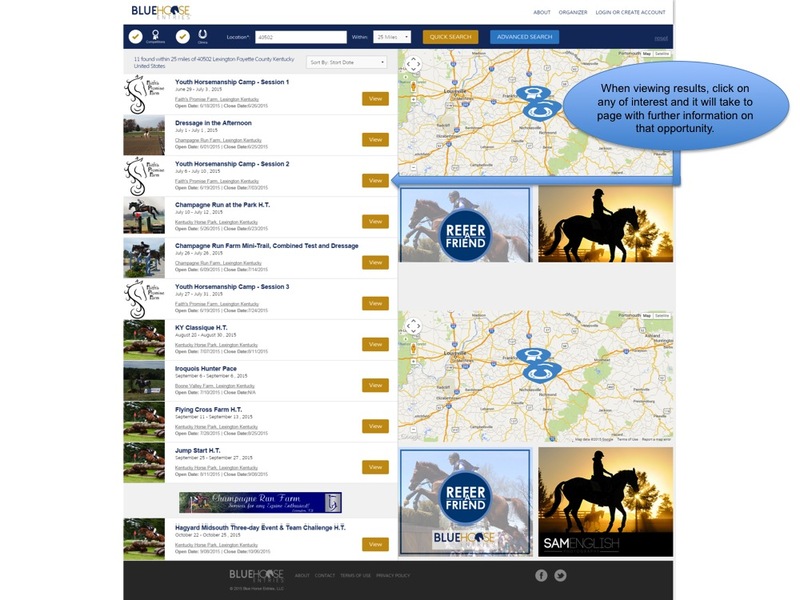 A QUICK SEARCH will produce results for competitions and/or clinics within a number of miles from a city. 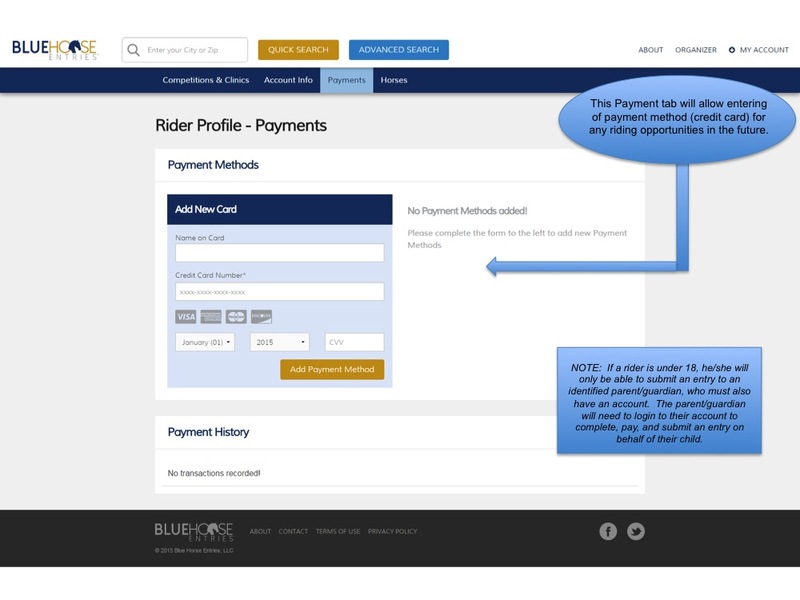 A rider can select either competitions only, or clinics only; if both selected or if neither are selected, results for both will be included. The designated city as well as the number of miles from that city can also be specified, with the default being within 50 miles of the [current (based on IP address) or last selected] city. 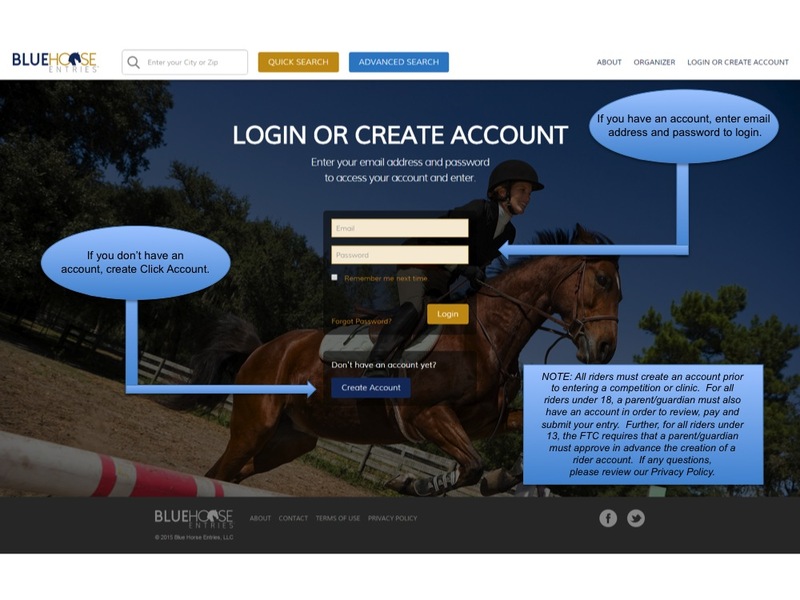 Each organizer of a competition or a clinic, whether a farm, group, association, horse park, riding facility, individual, professional rider, or other, will need to sign a standardized Organizer’s Agreement with Blue Horse Entries. Upon execution of this Agreement, the organizer will be provided an account through which details for each riding opportunity can be shared. 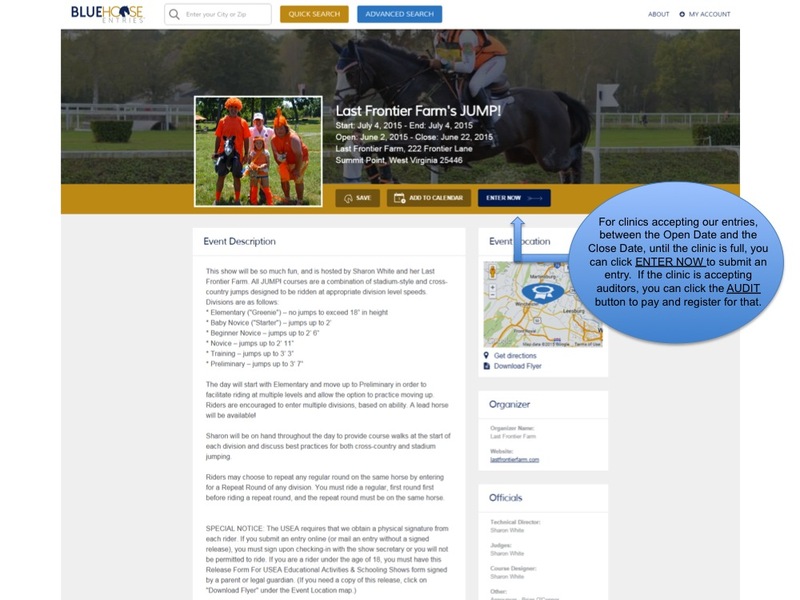 The Organizer's Agreement is a standardized document that is required for an organizer to have an account that allows for listing competitions and clinics. Issues addressed in the Agreement include obligations for both parties, payment of fees to organizer, advertising and use of information, confidentiality, and more. 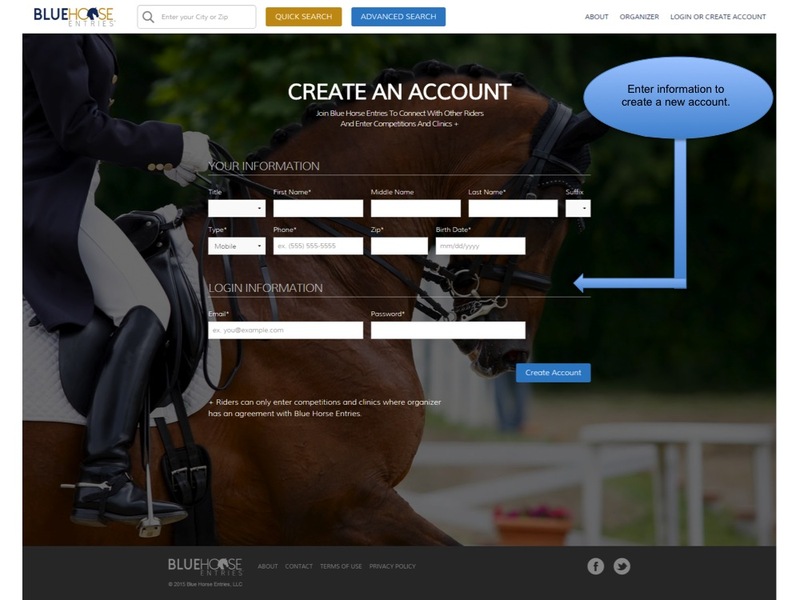 To start this process, contact Blue Horse Entries today! 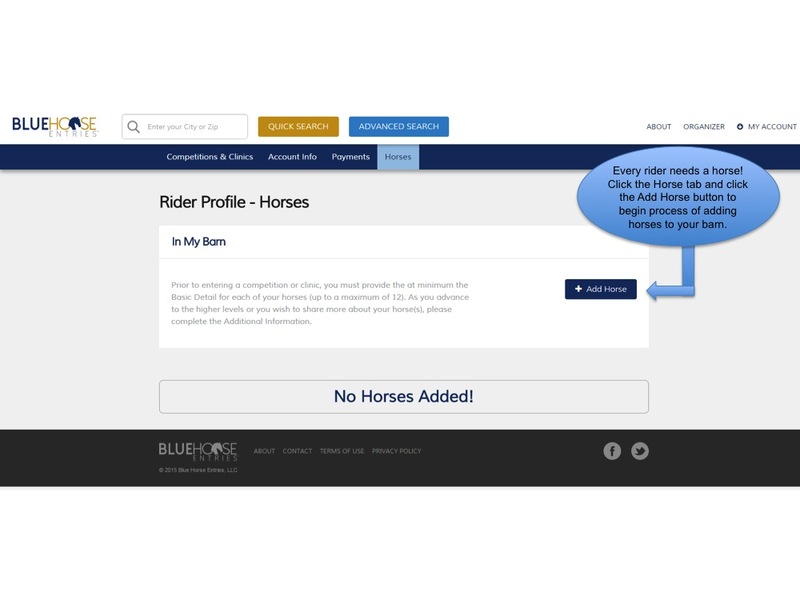 Amateurs to professionals, junior riders to seniors, whether you are still hoping for your first horse or already have a full stable, all will be able to create a rider profile. Each rider profile will contain at least the minimum information required for submitting entries to competitions or clinics. 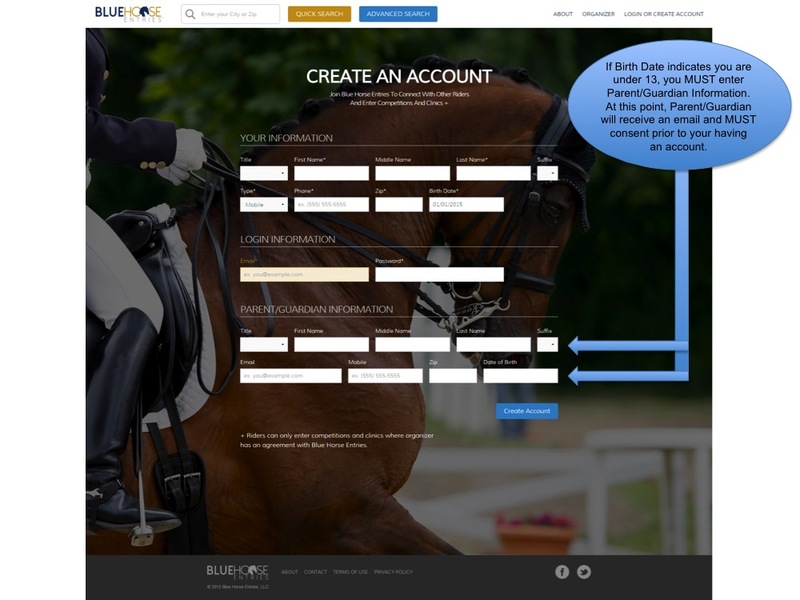 Beyond that, you can share as much of your story as you wish about your riding experiences and about your horse. With a rider profile, you can save selected search results of interest to your profile or even add them to your calendar. Don’t delay any longer, and setup your rider profile today! 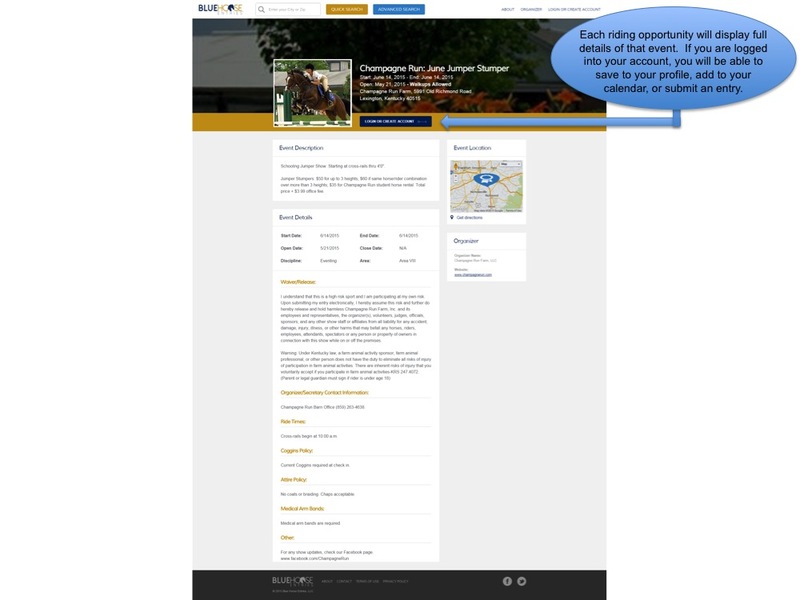 Encourage an organizer to list their events on the Blue Horse Entries calendar by entering their email address below.